The Stormtroopers have been upping their arsenal since the defeat on Endor. (Getting thumped by a bunch of teddy bear-like Ewoks will do that to a highly trained army). This Adult Deluxe Star Wars Ep. 7 Flametrooper Costume represents the First Order's new take on military maneuvers and it's looking quite intimidating. We're pretty sure that spear-wielding Ewoks won’t beat them this time around, at least not as easily as they did before. So if you’re ready to help the First order spread their reign throughout the galaxy grab this Star Wars themed costume today! You can start claiming parties in the name of the First Order this Halloween. 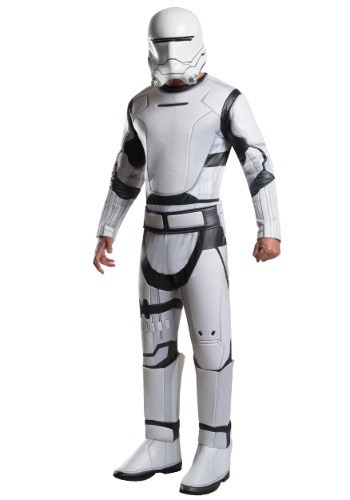 Have your friends look through the rest of Storm Trooper costumes. We have quite a wide variety so we know that you guys will make an amazingly diverse team and will have no problem taking over parties, one after another! This jumpsuit has plenty of padding from your shoulders down to your boots. Then your helmet is made with two separate pieces that will easily Velcro together to complete your space-age armor. Be sure to take a look through the many different Star Wars accessories we have in stock. You can pick out a blaster to take care of any pesky Rebel scum and be sure to grab a pair of gloves. When you’re working on the Dark Side, your hands are bound to get dirty! Join the First Order today and make Supreme Leader Snoke proud to call you one of his loyal soldiers. He’ll need someone to rely on since Kylo Ren seems to be having so much trouble and that someone can be you!